Enjoy the area's entertainment, theatre scene and opera with a rental holiday home in Koreatown. This welcoming city is known for its restaurants, shopping and local tours. Hollywood Walk of Fame and Dolby Theater are just a couple of the must-see attractions in the area. A holiday rental can help make your stay complete—many rentals come with a full kitchen and laundry facilities. The nearest airport is in Santa Monica, CA (SMO-Santa Monica Municipal), located 9.1 mi (14.7 km) from the city centre. If you can't find a flight that works for your travel itinerary, you might consider flying into Hawthorne, CA (HHR-Hawthorne Municipal), which is 9.7 mi (15.6 km) away. Utilise the area's public transport and catch a ride on the metro at Wilshire - Normandie Station or Wilshire - Western Station if you're interested in seeing more of the city. Where to stay near Koreatown? Our 2019 accommodation listings offer a large selection of 1,124 holiday rentals near Koreatown. From 676 Condos/Apartments to 314 Houses, find unique holiday homes for you to enjoy a memorable holiday or a weekend with your family and friends. The best place to stay near Koreatown is on HomeAway. What is the best area to stay when travelling to Koreatown? Can I rent Condos/Apartments in Koreatown? 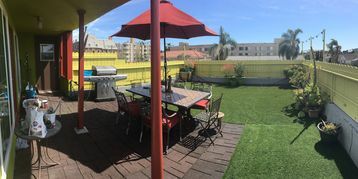 Can I find a holiday accommodation with pool in Koreatown? Yes, you can select your preferred holiday accommodation with pool among our 288 holiday homes with pool available in Koreatown. Please use our search bar to access the selection of holiday rentals available.